How to make ozonated water? Ozonated water is ozone gas dissolved in water. When ozone is bubbled through water it is able to be temporarily suspended among the water molecules. The colder and the purer water is, the more ozone it can absorb and the longer it can hold the ozone concentration. Drinking ozonated water is a great way to supply ozone to the upper gastrointestinal tract. 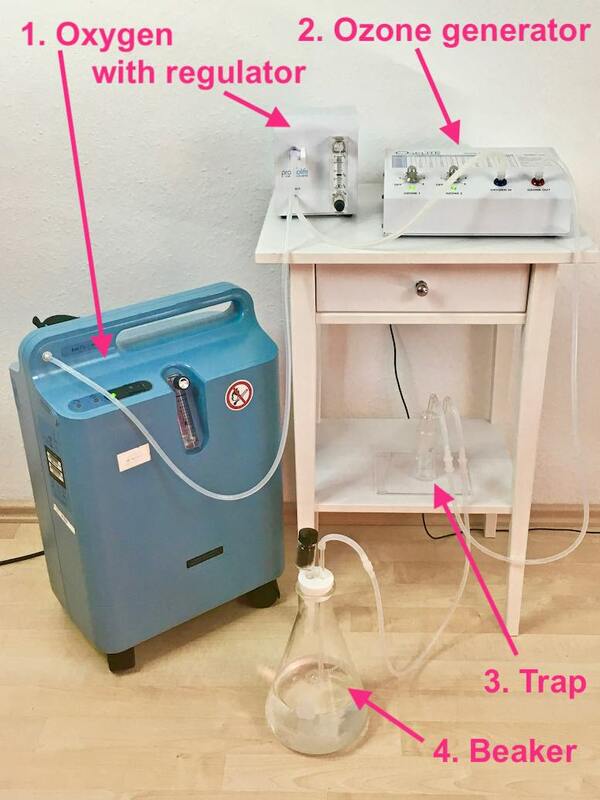 A O3 water setup with a refurbished Respironics Everflo oxygen concentrator, an external low flow regulator, an ozone generator, a trap and a water bubbler or beaker with a destructor attached to it. Placing the water bubbler with the water well below the ozone generator is an extra precaution against backflowing water which could damage the generator. 1. Oxygen source: Either an oxygen tank or an oxygen concentrator can be used which produces oxygen of at least 90% purity. Make sure your oxygen source comes with a low flow regulator. For a concentrator you will need an external low flow regulator. For a tank, you’ll need either a CGA 540 or a CGA 870 regulator. 2. 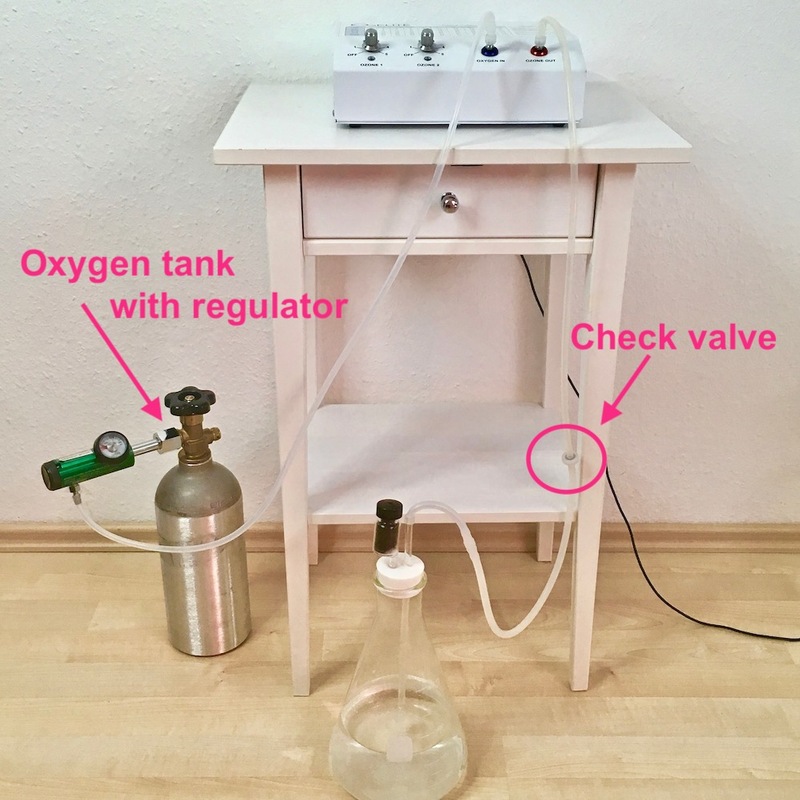 Ozone generator: Ideally you’ll want an oxygen fed ozone generator. Most of the recommended generators on this page will do the job. The higher the maximum output of the generator, the stronger you can make your ozonated water. I suggest not to exceed concentrations of 100 to 120 mcg/ml. 3. Trap: serves to prevent water from flowing back into the generator and damaging it. It’s essentially a small empty humidifier. When setting up your equipment, make sure you connect the tubing the right way. The line which transports ozone from the generator should connect to the “in” port on the trap which is the one connecting to the stem. The outflow of the trap is then connected to the beaker with the water. 4. Beaker or water bubbler: this is where you pour the water in. Typically water bubblers have a small stone attached to their stem. When you pour water into the beaker, make sure that stone is covered. Instead of a beaker can use any type of humidifier, gas washing bottle, or simply an empty glass bottle, just make sure you protect yourself from the escaping ozone gas. A trap to collect backflowing water and to protect the ozone generator. Make sure you connect it with the other equipment in the correct order. A more affordable way is to buy a gas washing bottle on amazon but you will likely need different sized silicone tubing. 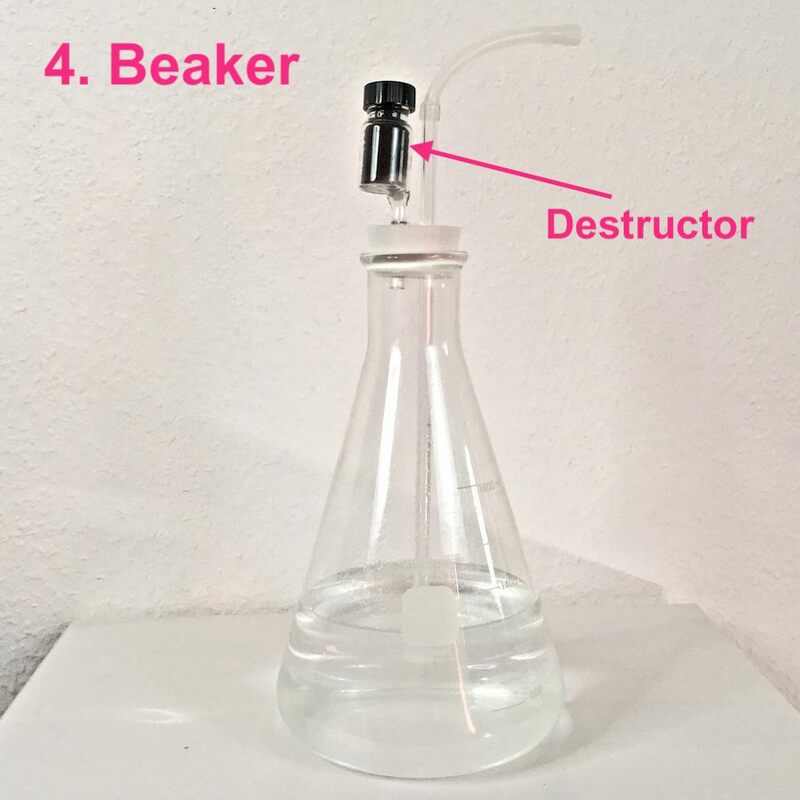 Above you see a 2,000 ml beaker or water bubbler from Promolife with an attached destructor. A destructor is very convenient. That way there is no ozone escaping into the room. You can also use any other glass ware like an old and clean glass bottle. Just make sure you leave the room while the ozone generator is on. An alternative set-up for ozonating water with an oxygen tank and a check valve instead of a trap to protect the generator. One of the best solutions for oxygen tanks are the pre-filled cylinders. 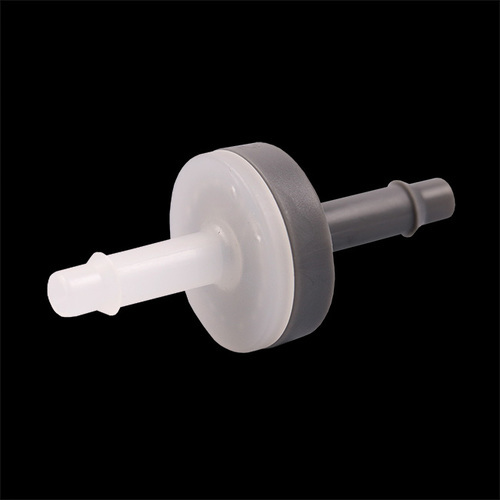 A check valve prevents water from flowing back through the tubing. 1. Plug the oxygen source (if it’s a concentrator) and the ozone generator into the power supply. Connect everything as shown in the pictures above. 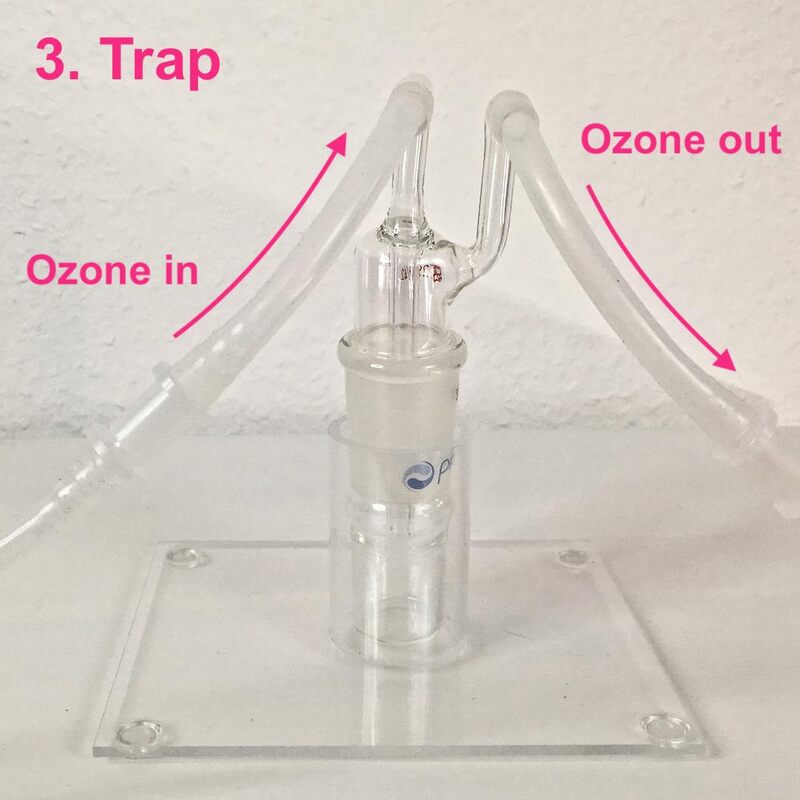 If you’re using a trap: make sure it’s in the correct order: the stem of the trap should be connected to the ozone output of the ozone generator. 2. Pour water into the beaker. 3. Open or turn on the oxygen source. If it’s a tank: open the valve of the tank and the regulator to a low flow of 1/8 LPM. If it’s an oxygen concentrator: let the machine warm up for a few minutes, then adjust the external regulator to 1/8 LPM. 4. Set the ozone generator to the maximum ozone concentration. I suggest not to go higher than 100 mcg/ml. 5. If the beaker has an attached destructor, you don’t need to do anything further. Just wait until the water is done. If you’re using an open bottle to ozonate the water, leave the room as long as the ozone generator is running. 6. Once the water is done, turn everything off. Drink the ozonated water as soon as possible. The longer you wait, the more ozone the water will lose. Hold your breath while drinking in order to prevent breathing in ozone gas. 1. What type of water is the best for ozonating? 2. Can I make a larger batch of ozonated water, put it in the fridge, and drink it later? You can, but keep in mind that even distilled water of 5 º C (41º F) loses more than half of its original ozone charge within 1 hour. So keeping ozonated water in the fridge will not prevent it from losing ozone, it will only slow it down somewhat. [Source]. Best is to ozonate water right before drinking it. 3. Can I ozonate alkaline water? The more alkaline water is, the less ozone it retains and for a shorter amount of time. [Source] So, alkaline water is not ideal for water ozonation. 4. Do I need to buy an expensive oxygen fed ozone generator just to ozonate water? No, you don’t. If all you want to do is ozonate your drinking water or wash your foods, this type of inexpensive air fed ozonator should work just fine. 5. Can I just ozonate my tap water and drink it? Won’t ozone remove all the bad stuff and make it super pure? It’s not recommended to ozonate tap water, since tap water can contain bromide which through ozonation can turn into bromate, which is a known carcinogen [Source]. It’s better to use mineral water, but best to take either distilled or reverse osmosis filtered water. 6. I drank some ozonated water and now I experience bloating, cramps, and nausea. Why is that? I thought ozonated water is supposed to help with digestion. Ozonated water can react with undigested food in your digestive tract. That’s why it should only be drunk on an empty stomach, or 3 hours after eating. Wait 20 minutes after drinking ozonated water before you eat something again. That way you prevent bloating and cramping. 7. Do I need a fancy water bubbler for $150 in order to ozonate some water? I mean, that’s crazy. No, you don’t need a fancy water bubbler at all. 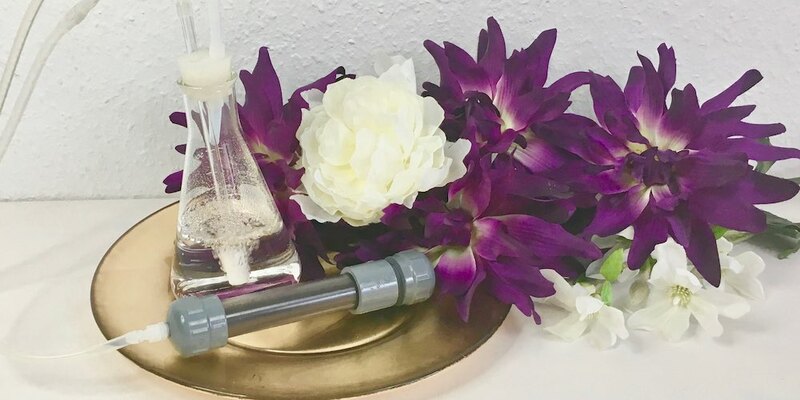 You can just take any glass ware, either bottle, beaker, or even just a glass, dip the ozone output hose into the water and run some ozone through. The drawback is that there will be a lot of ozone gas escaping while you do that and you should avoid breathing it in. So either do it outside, leave the room, or put a mask on which will filter out ozone, if you chose to stay in the room. 8. Do I need a special stone for ozonating water? No, you don’t need a stone. You can just directly dip the silicone output hose into the water. The stone is supposed to make smaller bubbles and so make sure that more ozone is dissolved in the water better. I have found though that it also works perfectly fine without any stone. You may need to ozonate your water for a bit longer, but it works. 9. How much ozonated water do I have to drink in order to get rid of Lyme disease? Lyme disease tends to be a systemic infection which also requires systemic treatments. Drinking ozonated water is not a strong systemic treatment. It’s mostly a local treatment of the digestive tract, although if done in sufficiently large amounts and by very sensitive people there may be some small systemic effect. In order to treat Lyme disease effectively a more intensive approach may be necessary with intravenous ozone or ozone saunas, additional insufflations, and possibly other interventions. It’s unlikely that drinking ozonated water alone will eradicate the infection, although it may help with some symptoms to a smaller degree. wait 3 hours after your last meal before drinking ozonated water. do not put anything else in the water. Just use pure water. Preferably mineral or reverse osmosis filtered water. Distilled water is fine as long as you supplement with minerals afterwards. Adding salt is ok, too. Are you drowning in information? Talk to me! Do you see any value in using ozonated water as an enema following a coffee enema for detox purposes? Using 3 cups of saturated O3 water. I would do it the other way around: firs the enema with ozonated water, then a coffee enema. You want to prevent any ozone from reacting with coffee remnants. I have a ozone generator that puts out 500mg/ hr how long should I ozonate 500ml of water? ozonate it for around 15 to 20 min. Make sure to leave the room while the machine runs. Hi I hope you can help, my Ozone generator put out 8000mg hr I do have a Ozone Destructor from promolife. I use a Oxygen concentrator as well 5LPM is this to much Ozone? I cant convert Grams To Micrograms, well I have found a converter but I don’t understand the answer 8e+6. how can I compare this to Promolifes Generator at •Ozone output up to 110 Ug/ml (gammas) I’m lost,thanks for any help. this is definitely too much ozone. Your machine is not intended for personal use but most likely either for a swimming pool or to remediate homes. You should not be anywhere near it when it is on. Thank you very much for this info! An 8oz glass of ozonated water lasts only 20 minutes if left standing, but after it’s ingested, how long does it take for it to do its job? I take Pine essential oil for 3 days in a row and then take a few days off. Should ozonated water be avoided on the days I’m using Pine essential oil? I would space the O3 water and the pine oil by a few hours, then you are likely on the safe side. Hi Donna, I’ve ordered my turpinetine oil (pine oil) –the one jennifer daniels MD recommends, and plan to use it along with ozone water. I agree to take them at separate times. I think I may try one of the inexpensive air fed ozonators from Amazon for ozonating water as you’ve suggested above. The company that sells the most popular of these units (one with a diffuser stone) shows customers standing over or next to the water while it’s being ozonated. If I read you correctly above, this isn’t safe. Am I correct in assuming that when one of the air fed units is on, I would need to leave the room? If so, for how long? Second, it’s not clear to me from what I’ve read above that the O3 Elite Single Stage, which I will likely be buying for insufflation, is powerful enough to ozonate water. Am I right? Yes, I recommend to leave the room for as long as the ozonator runs. Unless you use a water beaker with an attached destructor, then you don’t need to leave the room. Yes, the Single Stage is powerful enough to ozonate water, but you will not be able to reach as high ozone concentrations as with the Double Cell. But you might not need to get as high. After making ozone water can you store it for a few days or should you drink it straight away as it looses its ozone. Do you recommend only having one 250 ml glass in the morning as I’m using it as well as other alternatives to treat stage 4 lung cancer. yes, you should ideally drink it right away. It will store in the fridge for some time but not at the same potency as when it was freshly prepared. One can drink 4 to 6 glasses per day or more. I would also consider doing BOO–breathing Ozonated Oil. Also find a practitioner who offers ozone IVs. Could you recommend a. Budget air fed water ozonator from amazon.co.uk in UK? Thank you. this one is ok. But it tends not to last very long. A few months in my experience. What would cause purified water to turn a bluish hue in color when ozonating water? Are you sure it was the water and not a reflection of some blue surface nearby? Are you using the blue bubbler stone. Those are made in China and not recommended for ozone water making. see my previous answers. I hope I covered all your questions? 1. What if i ozonated water and im not able to drink it all, is it still safe to drink? 2. so after 30 mins the effectivity of ozone is half life and after 2 hours is gone , so what is the state of water? is it remained alkaline? 3. What will happen to the body if i drink ozonated water after every eating? 4.Is it true that i can stock ozonated water for a weeks to a month? is it still pure? 1. Yes, of course. Many bottled mineral waters are ozonated before they are bottled. 2. After all the ozone is gone, you simply have ultra purified water, that’s all. Ozonation does not change the pH of the water, but the pH determines how for how long the water can hold the ozone. 3. You should not drink ozonated water after food, but around 15 before. You should wait a good 3 hours after you have eaten, before you drink the water. 4. Yes, you can stock it in the fridge, but it will keep losing the ozone. It will remain pure, yes. Unless it is re-contaminated. Can I use filtered water from my fridge to make ozone water? I hope so. You may want to check if it filters bromides. If it does, it should be fine. Hi Paola, thank you for what you do. I’m a huge ozone user as well (love Toby at Promolife) and have learned a lot from you. I’m on a water fast “water only” and have been using ozone water for a couple of days as mouthwash since nothing is allowed in the mouth which could stimulate digestion (not even salt water). Do you think if I DRANK or or even SWOLLOWED some ozone water it would stimulate digestion? I want to stay away from stimulating digestion for stimulation prolongs the hunger pangs and other issues. I strongly discourage you to drink ozonated water while on a water fast. It could spur on your metabolism and trigger a hypoglycemic episode.